Marylouise Minehan pictured here with her teacher Mr Gareth Logan. 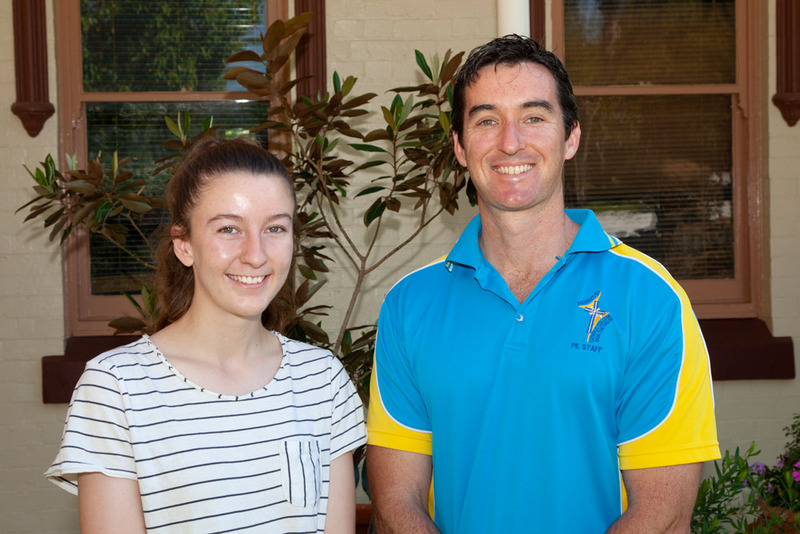 Hennessy Catholic College Year 12 student Marylouise Minehan recently made history by being the first student in Australia to complete the CSYMA and ACU Youth Academy program. The Catholic Schools Youth Ministry International (CSYMA) in conjunction with the Australian Catholic University (ACU) conducted the formation program which was open to all Year 11 and 12 students in Catholic schools right across Australia. It aims to engage young people and draw them into greater participation in the life and mission of the Catholic Church. Over the course of two years, Marylouise was required to complete five modules covering topics such as ministry, church, spirit and leadership. Her commitment required her to plan and implement a series of activities at Hennessy Catholic College and within her local Parish of St Mary’s Young. Throughout the year Marylouise attended a spirit retreat (a day of prayer, devotion and reconciliation centred around the Holy Spirit), ran children’s liturgy on Sunday’s, and helped plan the Hennessy’s Mission Week, she also attended a LEAD conference held in Canberra earlier this year. Marylouise had the support and encouragement of her family, fellow students and her teacher Mr Gareth Logan throughout the program. She will receive her National Catholic Formation Program Certificate from Mr. Ross Fox, the Director of Catholic Education at the annual Hennessy Awards ceremony being held on December 12. Marylouise will also be rewarded for her efforts when she applies for university entry at ACU in the coming weeks. Her ATAR will be automatically adjusted upwards by 5 points which will significantly increase her chances of receiving a University offer at ACU for 2019. If she succeeds she is keen to head to the ACU St Patrick’s Campus in Melbourne and has applied for entry to several courses including a Bachelor of Theology & Philosophy, a Bachelor of Visual Arts & Design and a Bachelor of Law & Global Studies.